The political situation in Fillory comes to a head. Julia makes amends and Alice makes a confession. 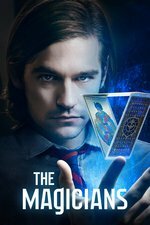 Den of Geek - Penultimate episodes are almost always among the best of the season, and The Magicians is not about to break that trend. Wow, this show keeps getting better and better. But I'm worried about Julia, I think Alice is going to continue with her plan. I just kind of want to talk about literally every single line of this episode. So much amazing, funny, crazy af, efficient af writing from the moment Josh says "Previously... on us." I mean, seasons 1 and 2 were fun in a "stupid plot, fun characters sort of way," so I'm not sure where this pivot towards protean insanity came from but I'm super high on it. For a world that's never had an election, Fillory sure took to it quickly. I've been rewatching season 2, and Margo was often, uh, not showing the best instincts (initiating a deal with the fairies without understanding the consequences, impulsively declaring war, etc.). I hope she's not still relentlessly hawkish and merciless as king. She and Elliot were often at odds about the right thing to do, and I think it's really lovely that he's supportive of her having a turn. This frees up Elliot for storylines other than scrambling to save Fillory (which probably means spending some time trying to find new purpose and figuring out how his wife fits into a civilian? life), but I hope Margo gets to branch out too. Does SyFy have to find CGI budget for more talking animals now? I feel like we need to see more of Margo's electorate. I love that, in their first election ever, it apparently didn't occur to any of the humans to deny voting rights to the the talking animals. The ways that Fillory is/isn't progressive are sometimes very charming. Julia's broad and deep new powers will be a challenge for the show if they last. A versatile deus ex machina terminates all plots, so I guess everyone better hurry up and get their cures before something happens to her. I missed Penny, and getting Penny 23 feels like a goofy way to keep a character/actor we love on the show, but the contrast of how relationships/friendships went differently in the 23rd timeline is interesting. I've been frustrated with Penny (40)'s storyline this whole season, and I was still hoping they'd find a way to bring him back. My guess (I haven't read the books) is that they figure out how to put 40 in 23's body. Penny often makes big sacrifices, and I could see 23 doing that because he knows everyone needs their friend back. That last scene made me cry again. Season 3 is so good. Penny 23's reactions to Josh's opening recap was the first time he felt like non-imposter Penny to me - I think maybe I've just passed through the denial phase of my reaction to Penny 40's loss to the Underworld. maaan how is this show so good? i loved everything about this episode. So I hope Julia also brought back all the Dryads she got killed? The election was hilarious. We knew there were millions of talking animals but I guess no one thought about them voting. And yes that last scene was really touching. Wow this was a great episode. Not quite as good as the lifetime in Fillory one, but close. So this is a second time that Margo reaped benefits from treating sentient nonhumans like people. Or third, if you count the fairy queen helping her out with the pirates. And now that I think about it, both cases involved being considerate about sexual matters. katieinshoes: Does SyFy have to find CGI budget for more talking animals now? I feel like we need to see more of Margo's electorate. I love that, in their first election ever, it apparently didn't occur to any of the humans to deny voting rights to the the talking animals. The ways that Fillory is/isn't progressive are sometimes very charming. They clearly didn't have the budget for talking animals in this episode, beyond Humbledrum (great bear name, btw - good job writers on plucking him from the first book) (Google books preview search results link). I'm thinking of subjecting my wife to this show, just so we can watch the end of season 3 together -- or find out that I'm more into magical fantasy drama than she is (but it's so much more than magical fantasy drama! Like the lifetime episode!). What are everyone's suggestions to pick from Season 1 and 2, if she's not hooked enough to watch it all? At first I thought that it was weird that the talking animal bloc would vote for Margo instead of one of their own but then I remembered how our last presidential election was a fiercely fought campaign that divided families over which plutocrat 1%er should run the country and I decided that small-r republican politics will probably always baffle me. Margo and Dean Fogg both getting their eyes back in the same episode suggests to me that there’s a thematic link between them. The Fairy Queen said that time would reveal the true extent of Margo’s change in perception; I wonder if the same is true for Fogg. I just started from the beginning with my partner, who is not super into this kind of show usually (and it took some coaxing/assurances it gets better to get through the first few episodes). We ended up whipping through season 1, I think he's hooked. He calls the show "Bogwarts", though.